When you hear the words “nighttime routine” you probably think about skincare. Because of this, we often don’t think about the fact that our hair also uses this downtime to restore itself as we sleep. We consider ourselves major hair care enthusiasts, so today we’ve decided to offer our top tips to improve your nighttime hair routine. Try these out and you’ll experience better hair days in no time! You might think that sleeping with your hair up in a messy bun or ponytail is harmless, but the tension can put a strain on your scalp and lead to hair damage. It’s not a bad idea to keep your hair away from your face, however, so we recommend sticking with a classic braid instead. This will save your ends from the breakage that occurs when your hair rubs against your pillow, and as a bonus you can wake up to gorgeous heatless waves! When hair is wet it is at its most vulnerable, so it’s important to dry your hair completely before bed to prevent tugging and breakage. 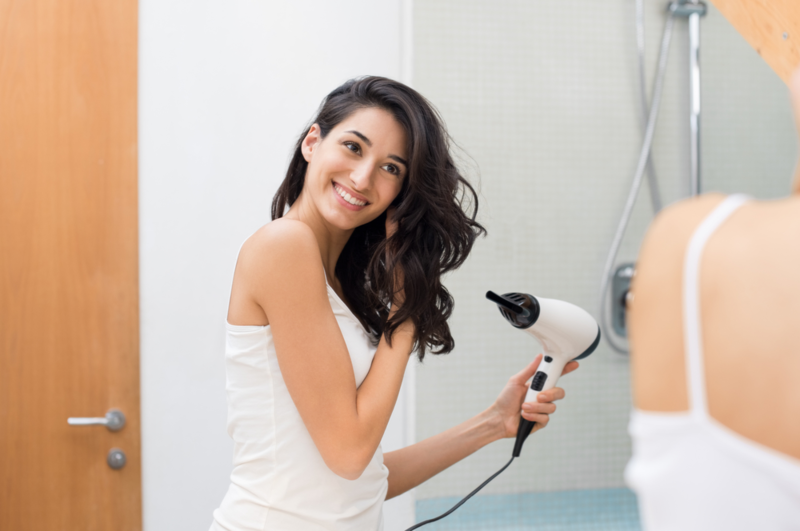 There are numerous time-saving advantages to washing your hair at night, so if you do so give yourself an extra hour or two to allow it to air dry, or give it a good blowout before bed (using a heat protectant, of course). While it might seem like a bit of an investment, trading up to a high-quality silk pillowcase will do wonders for your hair (and skin!). Silk is a much gentler fabric than cotton, and the smaller fibers of the material will help prevent damage to your delicate ends- especially if you toss and turn at night. It’s important to include masks and treatments in your weekly hair care routine, but sometimes the 15-30 minute masks just won’t cut it. Take advantage of your sleep time by applying a nourishing hair mask before bed. Leaving it on overnight will turn it into an intensive repairing treatment and leave your hair ultra hydrated. Depending upon your hair type, we recommend you try this once or twice a month. Ask your stylist for product recommendations based on your hair’s specific needs. By taking a few extra steps each night and incorporating hair care into your nighttime beauty routine, you can ensure that your hair is protected overnight so it can stay long, strong, and flyaway-free! Soon you’ll enjoy a good hair day every day! If your hair is in need of a little extra TLC, come see us at Salon d’Artiste. For an appointment, call us on 610.687.2020 or come see us at the salon at Eagle Village Shops at 205 Lancaster Ave. #2 in Wayne. Want to make an appointment instantly? Use our app which is available through the Apple Store, Google Play, or Amazon.